ScreenTips are small windows that display descriptive text when you rest the pointer on a command or control. Enhanced ScreenTips are larger windows that display more descriptive text than a ScreenTip and can have a link to a Help article. You can set an option to show or hide ScreenTips. Show feature descriptions in ScreenTips This option turns on ScreenTips and Enhanced ScreenTips so that you see more information about a command, including the command name, keyboard shortcuts, art, and links to Help articles. This is the default setting. Don't show feature descriptions in ScreenTips This option turns off Enhanced ScreenTips so that you see only the command name and maybe a keyboard shortcut. Don't show ScreenTips This option turns off ScreenTips and Enhanced ScreenTips so that you only see the command name. 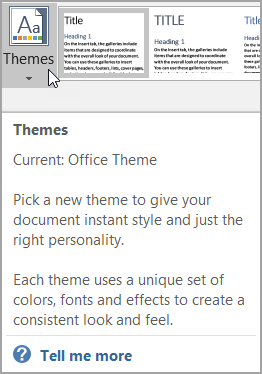 Note: The video shows the Office 2010 user interface (UI), but it still gives you a good idea of how the feature still works in Office 2013. Click the Microsoft Office Button , and then click Access Options, Excel Options, PowerPoint Options, or Word Options. Show feature descriptions in ScreenTips This option turns on ScreenTips and Enhanced ScreenTips. This is the default setting. Don't show feature descriptions in ScreenTips This option turns off Enhanced ScreenTips. You still see ScreenTips. Don't show ScreenTips This option turns off ScreenTips and Enhanced ScreenTips. Under Other, select or clear the Show ScreenTips on toolbars check box. On the Tools menu, point to Customize, and click Toolbars. On the Options tab, under Other, select or clear the Show ScreenTips on toolbars check box.